This week's Sweet Melissa Sundays (SMS) recipe was chosen by... me! After joining this baking group in April 2009, I had the honor of hosting back in May 2009 (I chose the Bee Stings). I have to admit that I often feel guilty that I am not able to bake along every week like some of the others in this group do. However, I love that the group only requires once monthly participation so that bakers like me can still join in. So, I am delighted to be hosting again! There were still quite a few recipes to choose from, but this one stood out to me because I love crepes! I figured this recipe would be quick and easy for everyone (I know many are busy because of the back to school period), and crepes lend themselves to a huge variety of fillings so everyone had the freedom to get a little creative. I thought it was really interesting that Melissa calls these crepes "French pancakes," especially because my mom used to make crepes for me all the time.... and she never made them from scratch like this. How did she make them? She used Bisquick pancake mix and simply added extra milk to the pancake batter to thin it out! So, the name "French pancakes" seems particularly fitting. Who knew that making crepes was so easy? I made a few different kinds of crepes. I started out with your most basic type of crepe - cinnamon and sugar. Simply remove your crepe from the skillet and immediately spread a small pad of butter around the crepe (I prefer to just take the stick of butter and "paint" the surface of the crepe with melted butter while it is still warm). 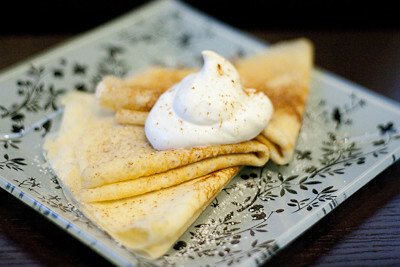 Sprinkle with cinnamon and sugar, and then fold the crepe into quarters. Top with whipped cream, sprinkle with some more cinnamon on top, and enjoy. 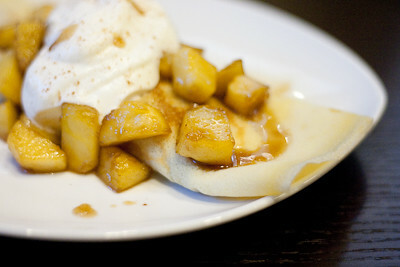 The second type of crepe I made was a caramelized apple crepe. I added about 2 tablespoons of butter to a hot skillet. After the butter was melted I added about 4 tablespoons of brown sugar and 2 diced apples. I sauteed the apples for a few minutes, until the apples were soft and the sugar was beginning to caramelize. I also added about 1-2 teaspoons of cinnamon to the apples. 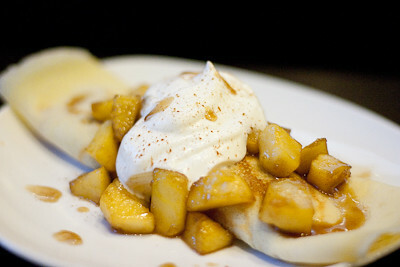 I then filled my crepes with the apples, rolled them up, topped them with more apples, whipped cream, and a sprinkling of cinnamon on top. The third type of crepe I made was a Nutella crepe. 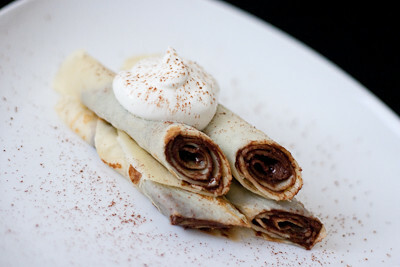 Simply spread a thin layer of your favorite chocolate hazelnut spread onto the crepe and then roll it up. Top with whipped cream and a sprinkling of cocoa powder. I loved all the different crepes I made, but this one was my favorite! Thank you to all the SMS bakers who joined me in making these "pancakes" this week. I hope that after seeing how simple it is to make crepes, you'll make them more regularly. I can't wait to see how creative everyone got with these. 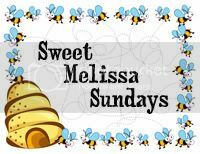 Make sure you check out the Sweet Melissa Sundays Blog Roll to see what everyone else did with their crepes! In a blender, combine the milk, eggs, and oil and pulse for a few seconds to blend. Add the flour, sugar, and salt and pulse again until the batter is smooth. Do not over-mix. The batter should be the consistency of heavy cream. For the best results, let it rest covered in the refrigerator for at least 1 hour or overnight before using. Preheat a 12-inch skillet (a seasoned cast-iron one works well, or a crepe pan, if you have one). Rub the pan with a few drops of oil. Repeat between pancakes if the skillet looks dry. When the skillet is hot (drop a tiny dot of batter on the skillet to check - if it sizzles, it's ready), pour about 1/4 cup of batter onto the pan, then quickly pick up the pan and swirl the batter around, aiming for a round shape (this takes practice, but it is not that difficult). Serve warm filled with jam, fresh fruit, ice cream, or whipped cream and sprinkle with confectioner's sugar. Enjoy! Crepes can be frozen between layers of wax paper and wrapped in plastic wrap and then in aluminum foil for up to 3 weeks. Defrost still wrapped at room temperature. Ooh la la! Thank you for choosing this week's recipe- they were awesome! Yours look great too! Im so sorry I had to miss this one Jamie. I think they look wonderful! My fav. is your apple ones, yum! I enjoy you and your blog! Beautiful photographs! Thanks for the great recipe choice! Wow Jaime, makes me want to come to your house for treats! These look amazing and like something I could tackle. Most of your recipes seem like a lot of work, I have no idea how you have the time and energy with your LO! :) I'm jealous! I'll be test driving these soon! Yum, yum! All your variations look great. I can't wait to make these again and try some fun combinations. Mine were lopsided, but still delicious! These look delicious! I love nutella crepes! Beautiful photos! Thanks for choosing a great recipe for this week. Your fillngs all look delicious. I agree with you that I wish I could bake along more often... this week included. Your photos of the crepes look amazing! I have never had them, but they may be going on my list to try as soon as I get somewhere a little more permanent! They look awesome Jaime. Sorry I wasn't able to make these along with you. But rest assured I will be making a batch of these soon - slathered with a bunch of Nutella. YUM! So cool! I love crepes and haven't made them in years. Your lovely photos entice me to cook them again. These crepes look so delicious. I can't wait to try your recipe.